TEMPORARY COOLING AND HEATING SOLUTIONS…. It’s what we do! 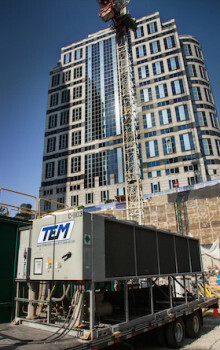 Since 1985, TEM has engineered temporary temperature-control solutions throughout California and the Western United States. We proudly build, install and maintain all of our own equipment. Our combined facilities span three acres where we store one of the largest fleets in California. Within our warehouses we have 40,000 square feet of interior storage containing coolers, boilers, chillers, hoses, cables, pumps and ducts. TEM’s highly trained personnel provide all in-house maintenance and service 24/7, 365 days a year. We can handle all commercial and industrial structure types and have successfully delivered solutions for hospitals, hotels, universities, and other structures. Additionally, we have performed several unique applications such as concrete cooling, process cooling, domestic heating, production applications, just to name a few… So don’t hesitate to call us for your Temporary Cooling & Heating Needs.